Donald Trump's famous Russian fan Jump to media player Why Russia's most famous pop star is hoping for a Trump win in the US presidential election. Crossing Siberia, talking Trump Jump to media player BBC Pop Up travelled across Russia via the Trans-Siberian Railway, and asked fellow passengers about what they thought about the US presidential election. Trump to Russia: 'Find Hillary's emails' Jump to media player Donald Trump has "actively encouraged" foreign powers to hack his presidential rival Hillary Clinton, her camp says. Russia's most famous pop star has said he hopes Donald Trump will win the US presidential election in November. 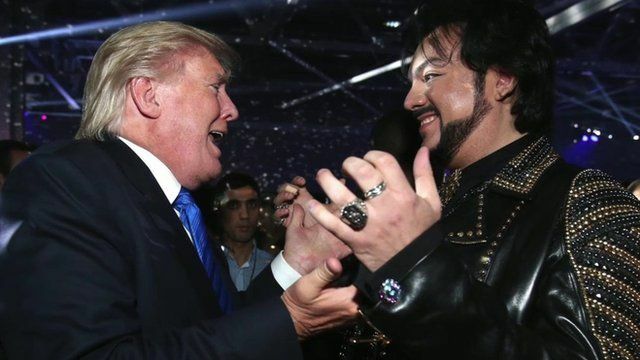 Philipp Kirkorov has known Mr Trump for nearly 20 years. He spoke to the BBC's Steve Rosenberg about how a Trump win would bring the US and Russia "closer".